The chair of the independent inquiry into child sexual abuse has rejected calls for it to be scrapped or scaled back, saying its scope is "a virtue". Prof Alexis Jay said the broad nature of the inquiry would allow it to recommend "fundamental changes". None of its 13 separate investigations will be dropped, a report said, but it may stop short of examining whether the late peer Lord Janner abused children. The inquiry has announced it will only hold four public hearings next year. The announcements were made in a report following an internal review, ordered by Prof Jay after her appointment in August. The report also set the troubled inquiry's timetable for 2017.
Who is Prof Alexis Jay? Prof Jay said she planned to make recommendations in an interim report in 2018 and vowed to make "substantial progress" by 2020. However, IICSA officials refused to say when the inquiry would end. Writing in the review, Prof Jay said: "I plan to make recommendations in an interim report in 2018 and I am determined that the inquiry makes substantial progress by 2020." 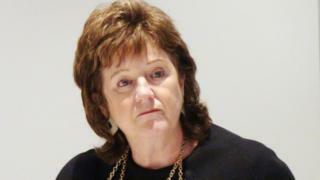 She added: "There have been suggestions that the remit of the inquiry is too broad to succeed. "I disagree. Its scope is a virtue, allowing it to recommend fundamental changes beyond the reach of an inquiry with a narrower remit." Prof Jay was appointed to the troubled inquiry after the sudden resignation of New Zealand judge Dame Lowell Goddard. She is the fourth person to chair the inquiry, which was first established in 2014 but has yet to hold a public evidence session. The inquiry's investigations will look into cases as diverse as "the internet" and local councils. There have been calls for it to be scaled back, with Dame Lowell Goddard saying there was an "inherent problem" in its "sheer scale and size". However, Prof Jay concluded that no public hearings would be cancelled and all the investigations would be retained. The inquiry also announced it could stop short of investigating whether the late Labour peer Lord Janner did abuse children. The inquiry previously announced the investigation of allegations against Lord Janner had been delayed because of a parallel police investigation. It said it was considering refocusing the Janner inquiry to concentrate on how institutions responded to allegations against him. The review said it may not need to make "findings of fact" relating to whether he abused children. Lord Janner's son Daniel welcomed the announcement, which he said suggested the inquiry was "stepping back from the unfairness of making findings of fact in relation to these false allegations given my innocent late father is dead and cannot answer back". The inquiry's new timetable has scheduled hearings on the abuse of British migrant children overseas for February and July next year. In October, there will be a hearing on abuse in Rochdale, including the role of the late MP Cyril Smith. There will be a hearing in December 2017 about the English Benedictine Congregation in the Catholic Church, while in March 2018 there will be a hearing regarding its Anglican Church investigation. The inquiry has been under pressure, including from its former chair, to get a grip by reducing the scale of its remit. Prof Alexis Jay has argued that its wide scope was necessary and has affirmed this position. Rumours that some of the 13 investigations would be scrapped have proved groundless, which has encouraged those involved. The news that only four public hearings will take place next year - relating to only three investigations - has disappointed some victims, who are also concerned the inquiry could hold fewer public evidence sessions than once expected and may not make judgements about whether some alleged abuse took place. Prof Jay will hope this review allows the inquiry to move beyond its troubled history. She has set a date for an interim report, as well as setting out a timetable of hearings and seminars. But this will not reduce the pressure on an inquiry which has moved at a pedestrian pace - and gained many critics - since its inception more than two years ago. Abuse survivor Phil Johnson - a core participant in the Anglican Church strand - told the BBC that was a "significant delay." "I was told it would be late summer, probably September 2017," he added. "There is a need for robust, thorough and timely investigation." A senior official said it was the first time the body had published a timetable "and we will stick to it". The review includes updates on all 13 investigations. It also revealed a strand examining claims against "people of public prominence, past and present, associated with Westminster" has inspected documents held by the Cabinet Office and the intelligence agencies. The inquiry will open a new hearings centre in central London in the spring. Prof Jay said the inquiry would be "more agile, more open to participation, and more relevant to the needs of children". The inquiry said it hoped to appoint a senior lawyer to replace Ben Emmerson QC within a few weeks, following his resignation in September. He was cleared of allegations of sexual assault and harassment this week. Inquiry officials said they hoped the Shirley Oaks Survivors Association, representing abuse victims from the former children's home group in Lambeth, would return to take part in the inquiry after pulling out recently. They confirmed victims who did not want to give evidence would not be compelled to do so, despite the inquiry's powers to call witnesses who might be unwilling. Inquiry officials also dismissed suggestions the process was moving too slowly and that some alleged victims and abusers might die before it was completed. How does the inquiry into historical child sexual abuse work?